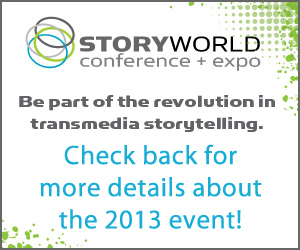 Thank you to the following sponsors for being part of the transmedia conversation at StoryWorld Conference + Expo. Be sure to check out their websites, and talk to them on site at the conference, to find out how you and your story can benefit from their products and services. Demibooks provides publishing platforms for interactive content. Demibooks® Composer is the first code-free, affordable way for publishers and independent storytellers to create interactive books for the iPad, right on the device itself. Demibooks® Storytime is a curated, multi-publisher marketplace for interactive children’s books produced on the Composer platform. Founded in 2010, Demibooks has offices in Chicago and Sydney. For more information please visit demibooks.com. 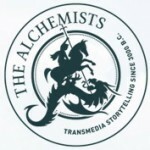 Putting the trans in media since December 2009, Transmedia L.A. advocates the awareness and application of transmedia storytelling principles by hosting meetups, workshops, and speakers in the Los Angeles area. TLA brings together a diverse group of individuals from various industries such as advertising, academic, non-profit, and entertainment - all with an aim of exploring the opportunities inherent in transmedia." Publishing Perspectives is an online journal of international book publishing news and opinion. With correspondents around the world, we provide personal stories and analysis from those on the cutting edge of digital, global, and self-publishing. StoryCentral Digital is a production company that incubates and develops ground-breaking transmedia properties with global partners in publishing, film, television and gaming and works with writers, experience designers, storytellers and technology start ups - focussing on story as the hub and basis for the creation of innovative storytelling for the digital age. storycentral continues to research and publish new thinking and developments in innovative storytelling, both commercially and in academia, is a content-partner with various production companies, studios, publishers and brands, hosts Transmedia Masterclass workshops and incubation/development services though Story Prototyping. The Alternate Reality Gaming Network is the largest and most complete news resource available for players of online collaborative Alternate Reality Games. For many years, this site was the central hub for an affiliate network of sites that were independently owned and operated by volunteers for the enjoyment of themselves and the ARG community. In October of 2006, the site’s focus switched over to being a news network first and foremost, and will continue to operate in this facility. Simply put, ARGNet is the place to be when news breaks about new ARGs, as it offers insightful, investigative reporting from dedicated, knowledgeable volunteers through articles, interviews and netcasts. Quite often, we also include interesting stories on events and innovative ideas that, while not direct news about ARGs, we think our audience will enjoy. We have an announcement list that you can sign up to that is low-traffic, but that serves as another way we can deliver breaking ARG news to you, and we are easy to contact through our voicemail, mailing address and contact form. Merging Media Productions Inc. is an event management + production company that develops + organizes industry events + initiatives. The Merging Media slate includes the annual Merging Media Conference in Vancouver and transmedia seminars, labs and workshops that have been delivered in Singapore, Toronto and Vancouver. The company’s current focus is to help promote the understanding of cross-media and transmedia production. Initiatives created aim at upgrading skills and knowledge, as well as providing intelligence, industry awareness and opportunities for partnerships to develop between media sectors. Merging Media Productions Inc. is the sister company of Pentimento Productions, a media consultancy run by Merging Media's CEO/Founder and Conference Executive Director, Christine Lim-Labossière. For over 20 years, Final Draft, Inc. has published Final Draft® software – the number-one selling scriptwriting application in the world. Our other offerings for writers include the Big Break screenwriting contest, the Insider View webinar series, ScriptXpert coverage services, and the Final Draft Writer and Reader mobile apps. To learn more visit www.finaldraft.com. The Greater Los Angeles Writers Society™ is for you! GLAWS™ is a 501(c) non-profit that provides a forum for writers of all disciplines to meet and improve their knowledge of the craft and business of writing.